PESHAWAR, Pakistan, Jul 1 2014 (IPS) - Three days ago, Rameela Bibi was the mother of a month-old baby boy. He died in her arms on Jun. 28, of a chest infection that he contracted when the family fled their home in Pakistan’s North Waziristan Agency, where a full-scale military offensive against the Taliban has forced nearly half a million people to flee. Weeping uncontrollable, Bibi struggles to recount her story. But Bibi does not have the luxury of grieving long for her little boy. Soon she will have to dry her eyes and begin the grim task of providing for herself and her two young daughters, who now comprise some of the 468,000 internally displaced people (IDPs) seeking refuge from the Pakistan army’s airstrikes on the militant-infested mountainous regions that border Afghanistan. Launched on Jun. 15, the army’s campaign was partly motivated by terrorist attacks on the Karachi International Airport that killed 18 people in early June. 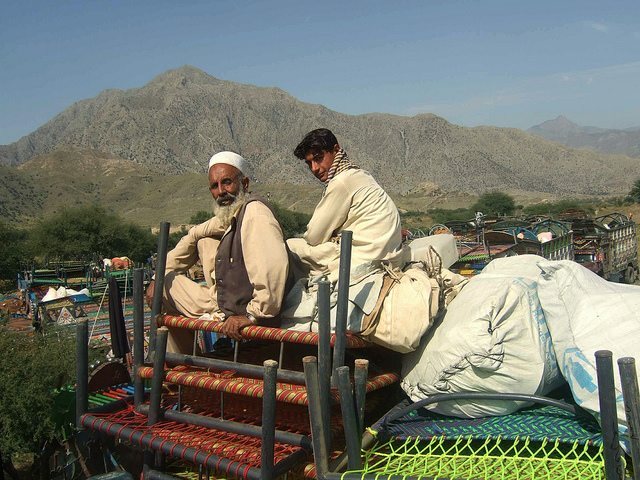 Having failed since 2005 to flush out the militants from the Federally Administered Tribal Areas (FATA), the army is now focusing all its firepower on the 11,585-square-kilometre North Waziristan Agency, where insurgent groups have enjoyed a veritable free reign since escaping the U.S. occupation of Afghanistan over a decade ago. Some political pundits are cheering what they call the government’s “hard line” on the terrorists. But what it means for a civilian population already weary from years of war is homeless, hunger and sickness. Most of the displaced have collapsed, fatigued from hours of travel on dirt roads in 45-degree heat, in massive camps in Bannu, an ancient city in the Khyber Pakhtunkwa (KP) province. Already groaning under the weight of nearly a million refugees who have arrived in successive waves over the last nine years, KP is completely unprepared to deal with this latest influx of desperate families. With tents serving as makeshift shelters, and the blistering summer heat threatening to worsen over the coming weeks, medical professionals here are warning of a full-blown health crisis, as doctors struggle to cope with a long line of patients. 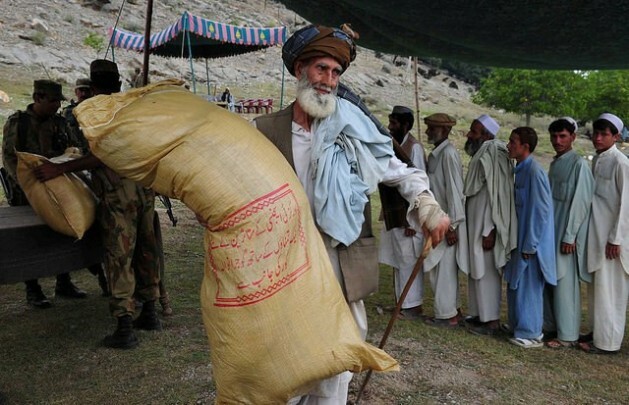 Muslim Shah, a former resident of North Waziristan, has just arrived in Bannu after a 45-km journey on an unpaved road with his wife and children. He is being treated at a rudimentary ‘clinic’ in the camp for severe dehydration, and recovering from a stomach flu caused by consumption of contaminated water along the way. 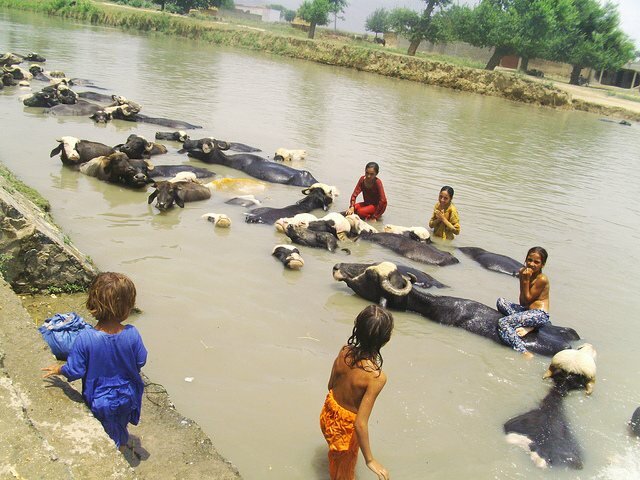 The frail-looking man tells IPS he is concerned for his family’s health in an unsanitary environment, gesturing to a nearby filthy canal where his children are bathing amongst a herd of buffalos. “We have examined about 28,000 displaced people,” Dr. Sabz Ali, deputy medical superintendent at the district headquarters hospital (DHQ) of Bannu, told IPS. About 25,000 of these, he said, are suffering from preventable diseases caused by sun exposure, lack of nutrition, and consumption of unclean water. On Jun. 29, the government relaxed its curfew, giving families a tiny window of escape before resuming its operation Monday. Families who left in the allotted timeframe are expected to descend on Bannu soon, prompting an urgent need for preemptive and coordinated efforts to avert an outbreak of diseases, Ali asserted. “Given the soaring temperatures, we fear outbreaks of communicable water and vector-borne diseases, like gastroenteritis and diarrhoea, as well as vaccine-preventable childhood diseases such as polio and measles,” he said. Ahmed Noor Mahsud (59) and his family of four epitomise the unfolding crisis. Mahsud himself is bed-ridden as a result of a heat stroke caused by walking 40 km in sweltering heat, while his sons – aged 14, 15 and 20 – have been suffering with diarhhoea, fever and headaches since they arrived in the camp on Jun. 22. The family has had very little access to clean water for nearly a week, which is exacerbating their illness. According to public health specialists like Ajmal Shah, who was dispatched by the KP health department, exhaustion among IDPs has even led to some cases of cardiac arrest. Out in the desert, families are also at risk of snake and scorpion bites, and could suffer long-term psychological stress as a result of the trauma, Shah told IPS. About 90 percent of the displaced are extremely poor, having lived well below the poverty line for over a decade due to the eroding impacts of terrorism on the local economy. Few can afford private care and must wait patiently for thinly-spread doctors to make their rounds. But for people like 30-year-old Jalal Akbar, a former resident of the town of Mir Ali in Waziristan, patience is almost impossible. The exhausted man fears their eviction will deprive him of his first child. Another major crisis looming on the horizon is a food shortage, which will only add to the woes of the displaced. Still, those like Ikram Mahsud, a displaced tribal elder, fear that the worst is yet to come. “We lack good food, and the non-availability of sanitation facilities like latrines, detergent and soap [means] our people are destined to suffer in the coming days,” he told IPS, adding that requests for clean water and sanitation facilities have fallen on deaf ears. Women and children currently comprise 74 percent of the IDPs, prompting the World Health Organisation (WHO) to point out, in a Jun. 30 report, the urgent need for “mass awareness campaigns among women to promote use of safe drinking water, hygienic food preparation and storage. “Information regarding benefits of hand-washing before eating and preparation of food, use of impregnated bed nets to avoid mosquitoes’ bites and prevent occurrence of malaria should also be encouraged,” the agency noted. WHO says it had sent medicines for 90,000 people to Bannu, but experts here feel this will fall short in the face of a spiraling crisis.